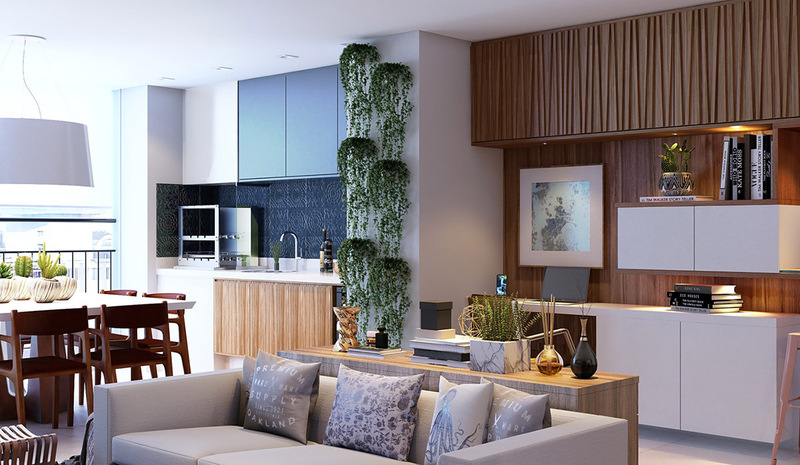 We all love to have a little house plant dotted here and there, to breathe a bit of life into the home and connect us with nature even when we’re spending time tucked away indoors. However, our little foliaged friends are often an afterthought when it comes to planning out our decor. 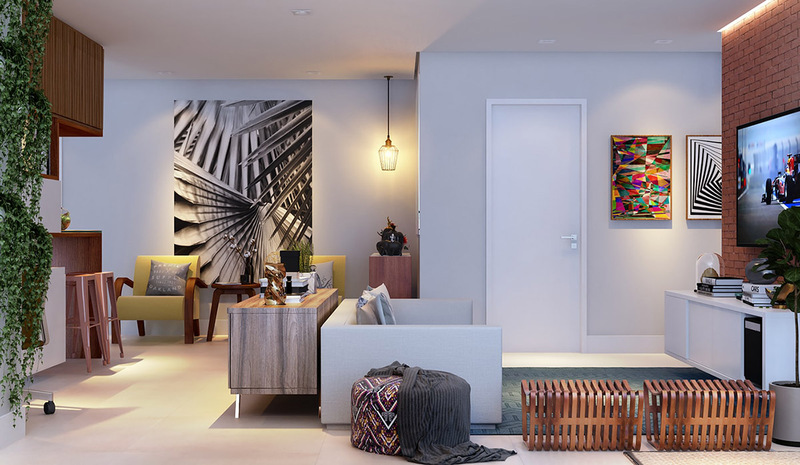 The designers of these three homes approached things a little differently. 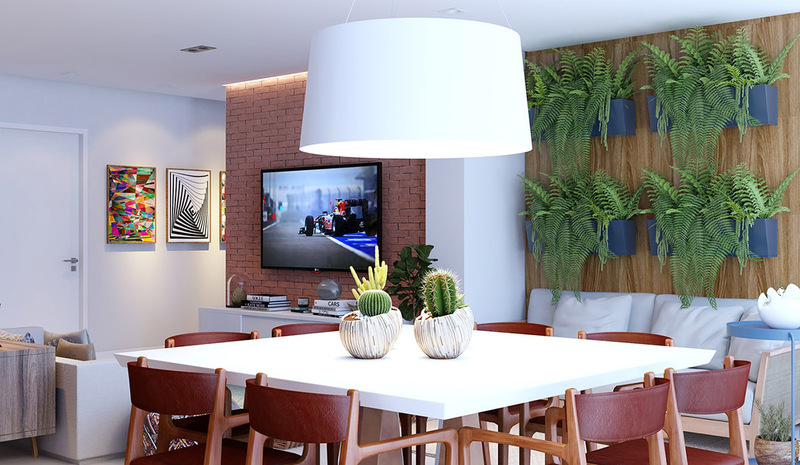 Instead of chucking random indoor plants into leftover spaces, the inclusion of plants was considered from the get go, as part of the considered decoration. 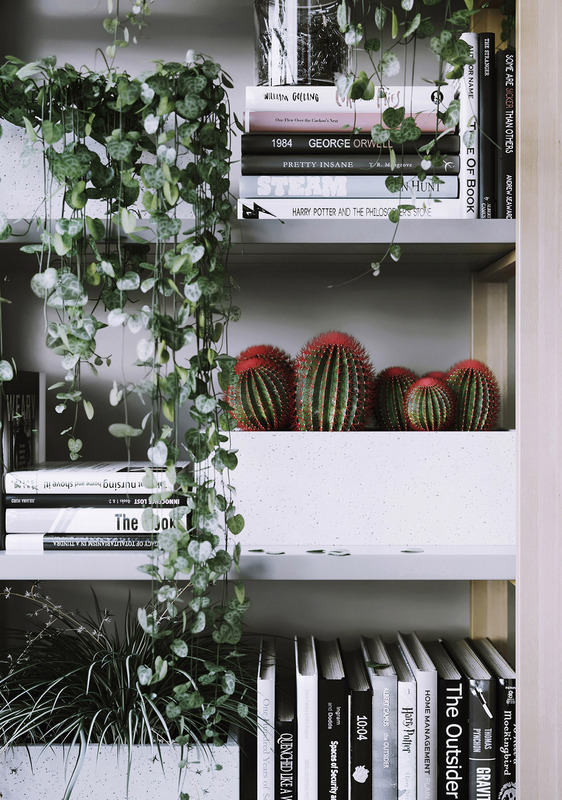 Decorating with plants makes perfect sense when you look at the array of colours and textures they can bring, and their revitalising effect on their surroundings. 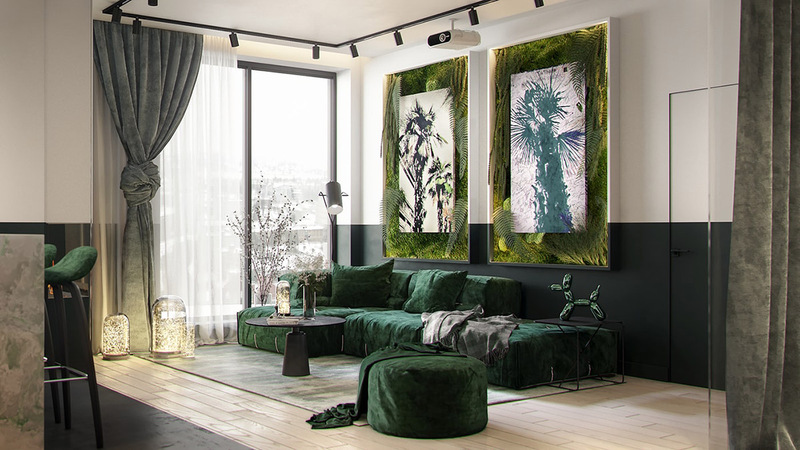 At first glance this 68 square metre home in Kyiv, Ukraine, follows a botanical theme more so in colour and art than in living and breathing specimens. 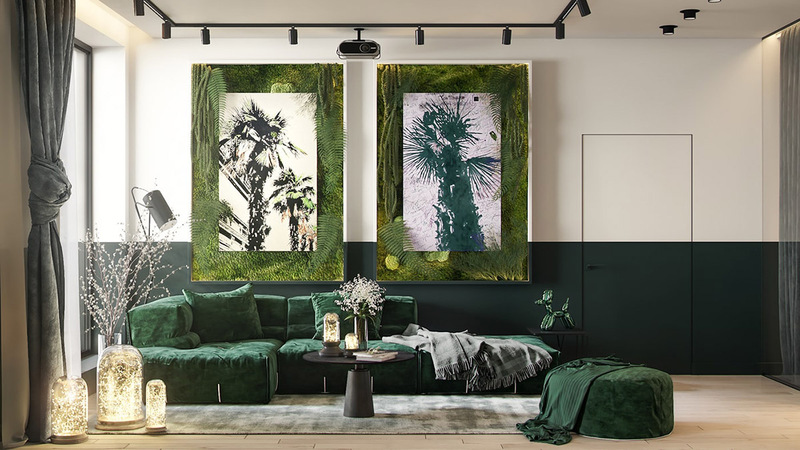 A few cut stems bloom in decorative vases around the lounge but the main focal point are a pair of palm tree art prints in tropical green mounts. A black side table displays a green balloon dog ornament, which matches the prints and the green sofa and ottoman set. The other side of the room reveals an open plan kitchen where we get our first taste of decorating with plants. 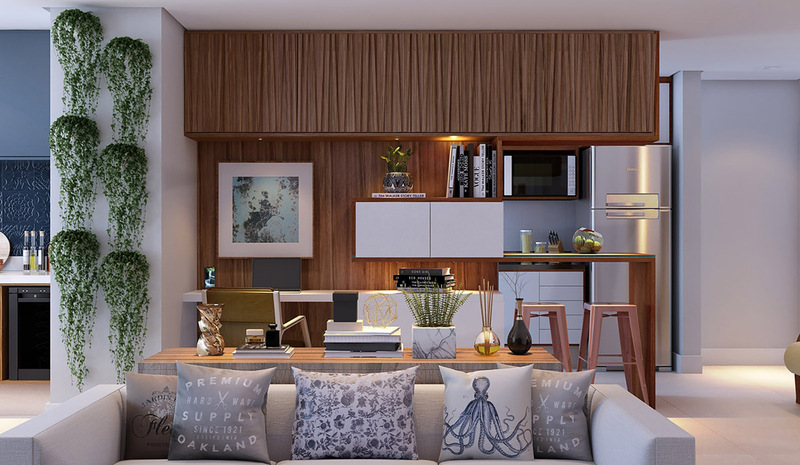 A glass dividing wall between the lounge and kitchen reflects the palm tree prints on the lounge wall. 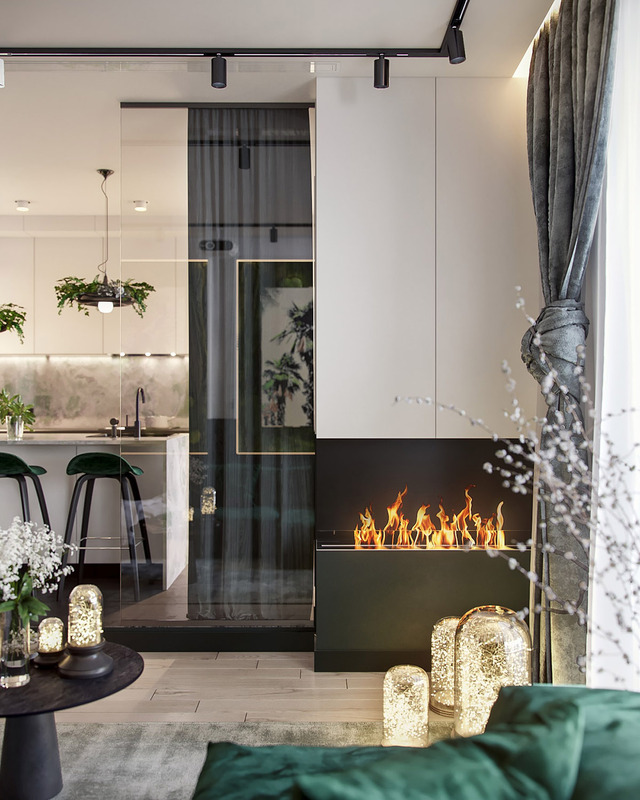 A modern fireplace flickers brightly to one side of the space. 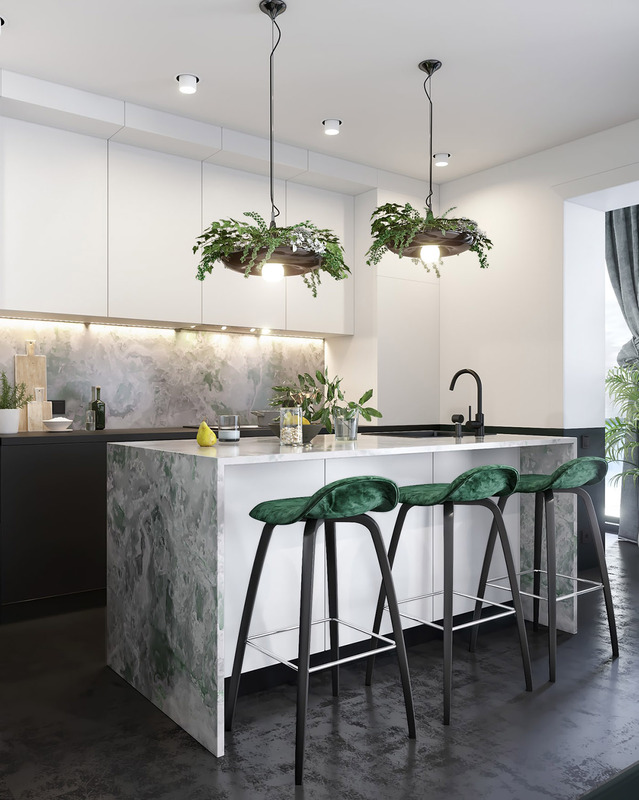 Three green velvety kitchen bar stools line up along one side to create a casual dining spot. 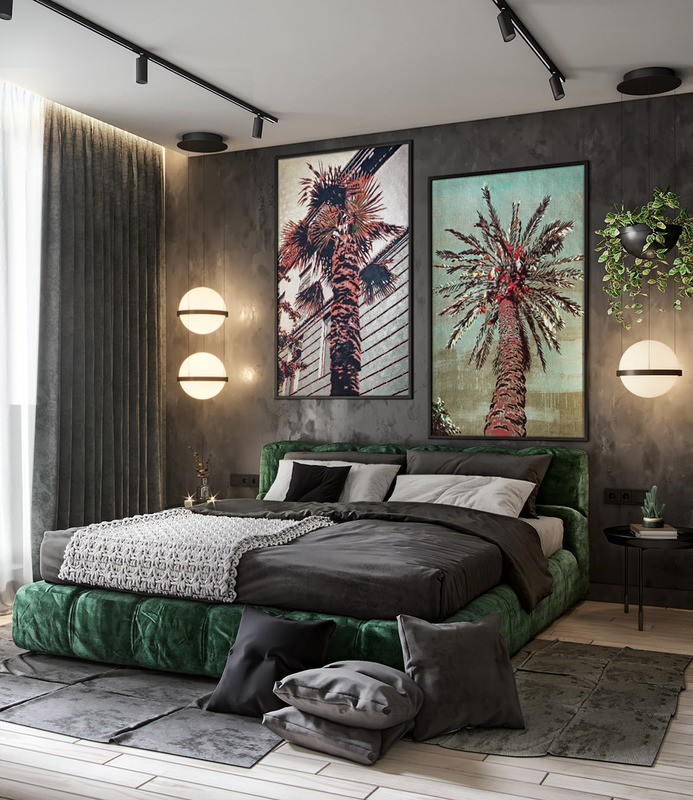 Another palm tree art print splashes shades of green over the kitchen wall. 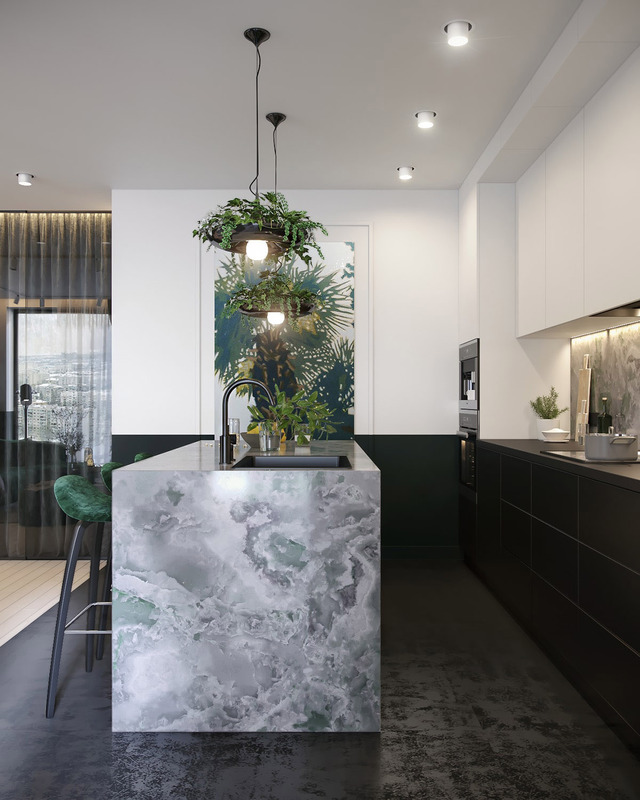 The kitchen island has green tones intermingled over its surface, like pressed leaves. 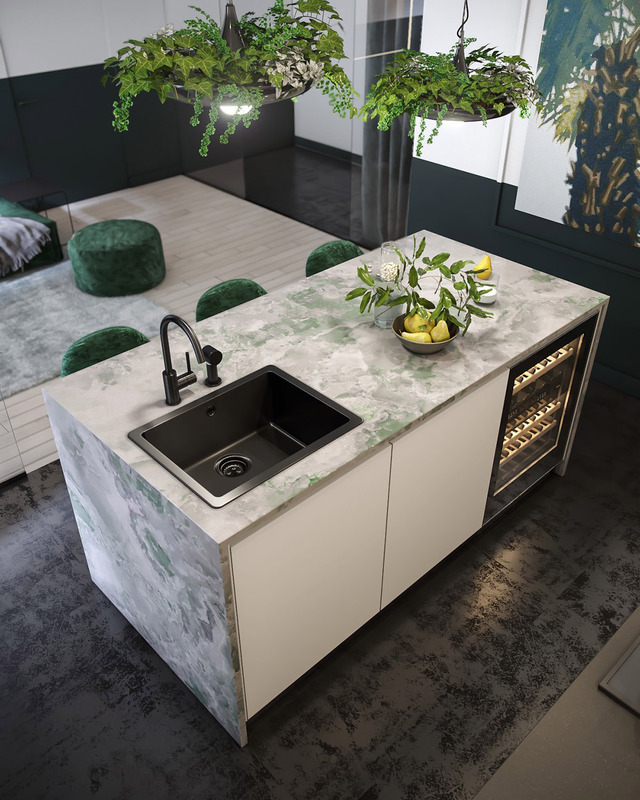 This beautiful kitchen island idea also includes the kitchen sink, and wine storage in the base units. 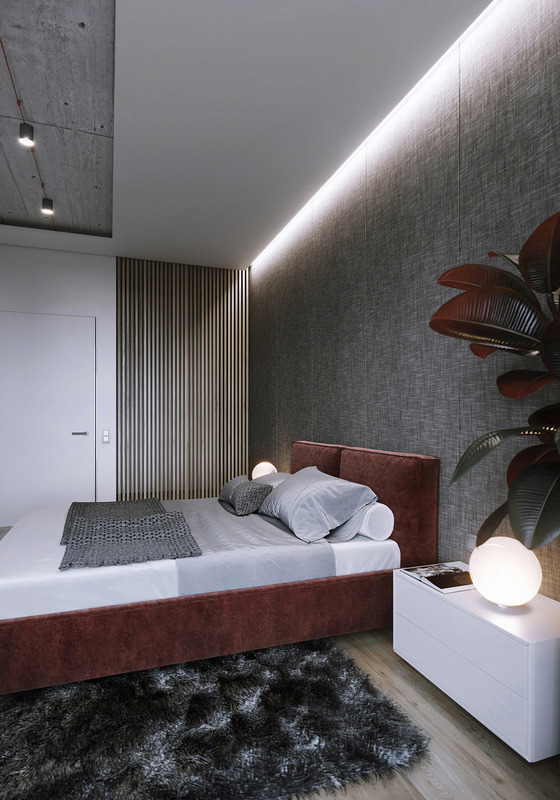 Hanging plants cascade amongst bedroom pendant lights. 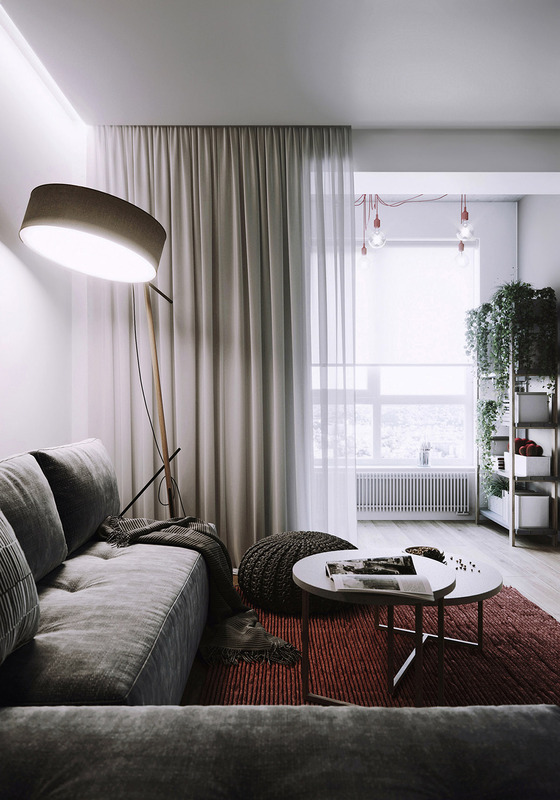 The glowing orbs and lush green leaves brighten the cool concrete walls and grey soft furnishings. 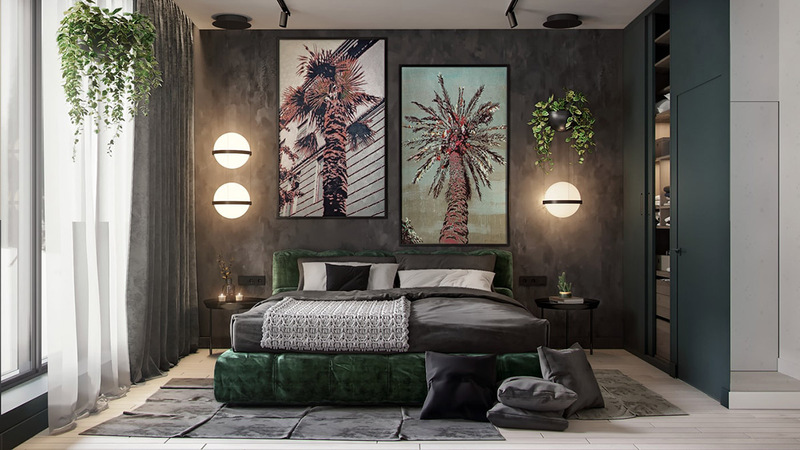 A plush green platform bed draws on the colours of the leaves. Tree prints hang above the headboard. 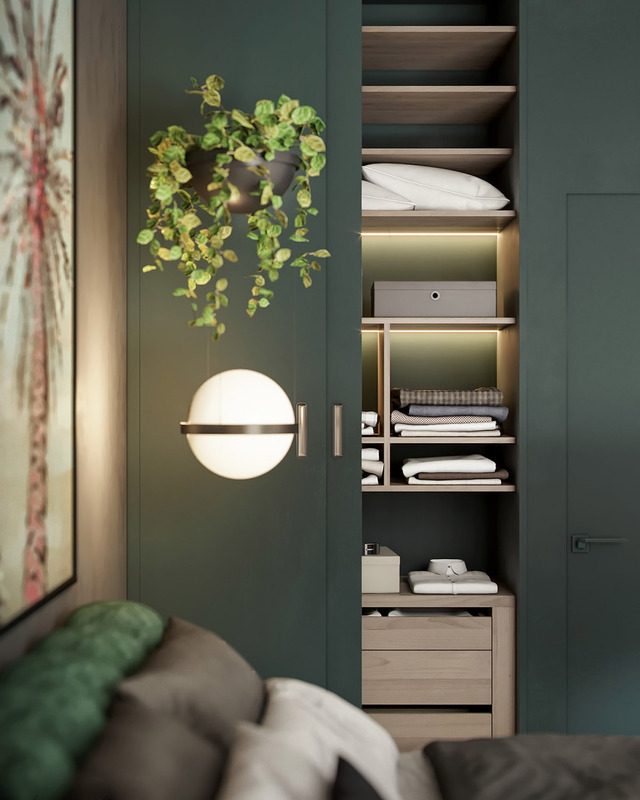 Modern closets have been finished in a deep green hue; mellow wood tone fills their interiors. Another piece of tree art grows out from behind a black bathtub, spreading its fronds across bathroom wall tiles. 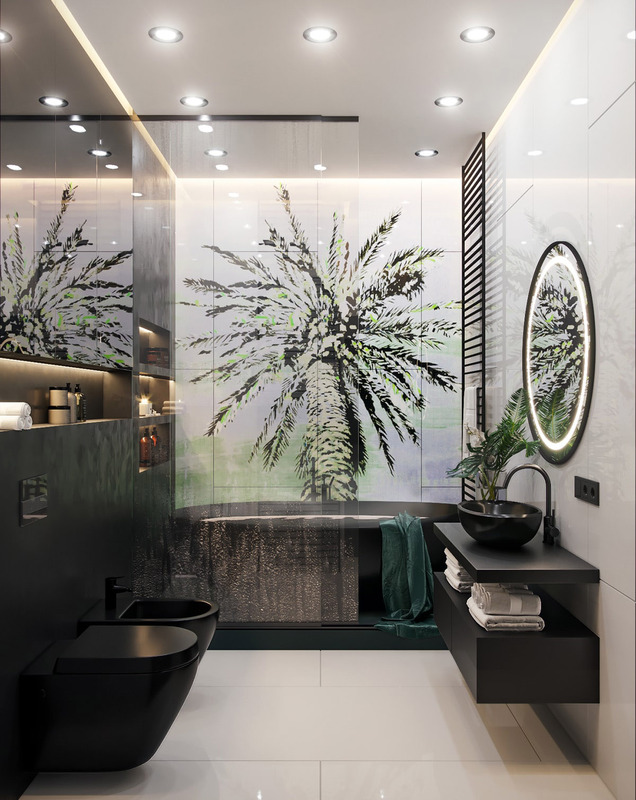 A wall mounted black vanity unit is decorated with a vase of tropical fronds. 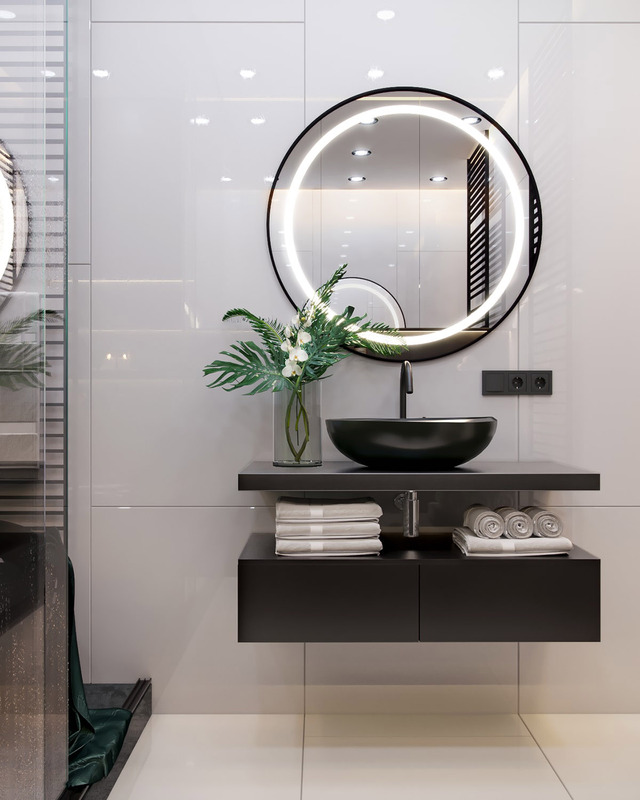 A round vanity mirror sets the ensemble aglow. 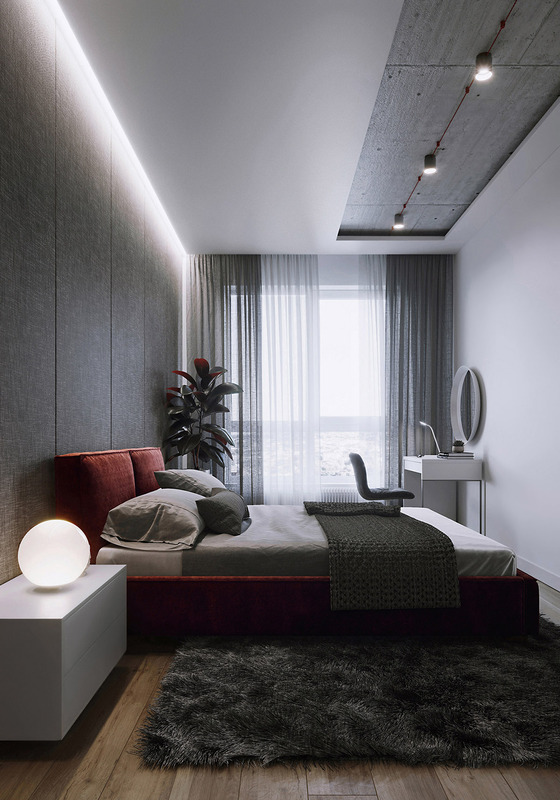 This 60 square metre studio apartment in Lviv, Ukraine, was designed for a young couple. 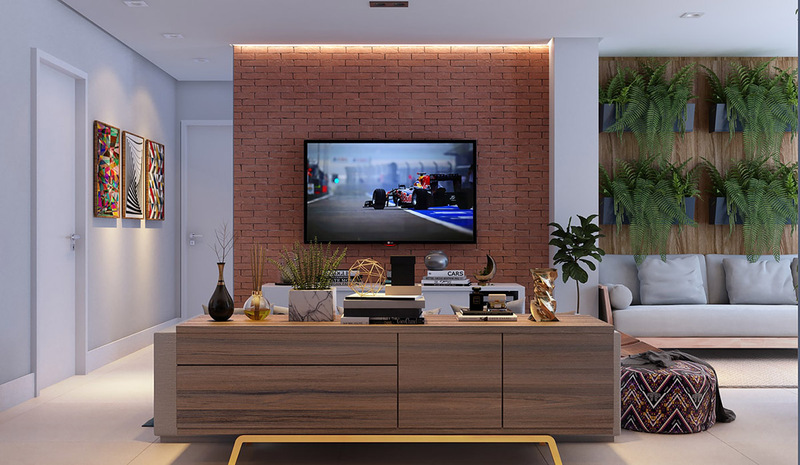 The lounge is furnished with a carved tree stump side table and garnet colour accents which contrast beautifully with the living greenery in the rest of the room. 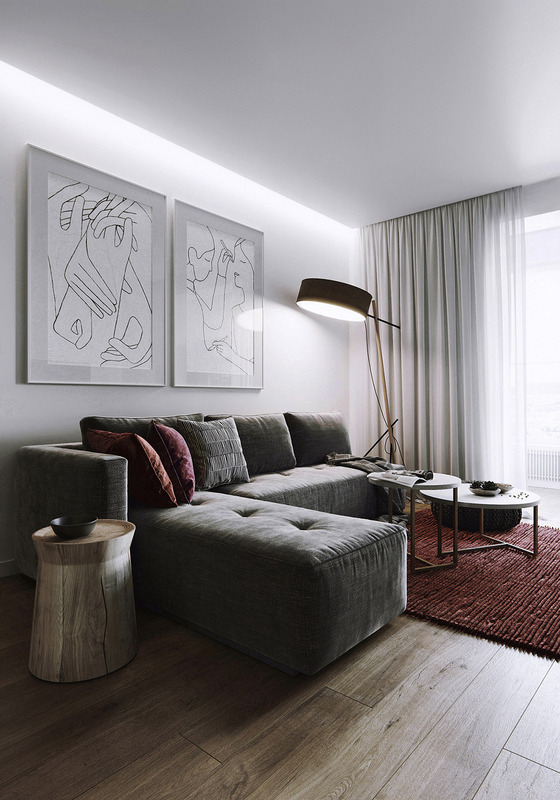 A wood stemmed floor lamp illuminates the grey sofa. 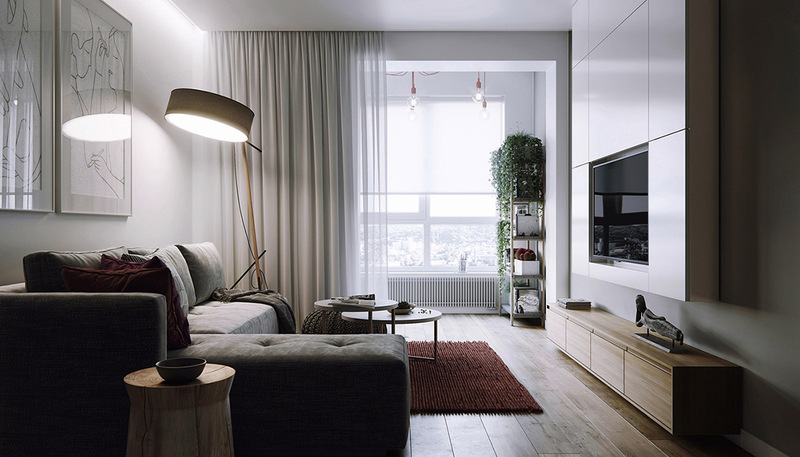 See more great floor lamps here. 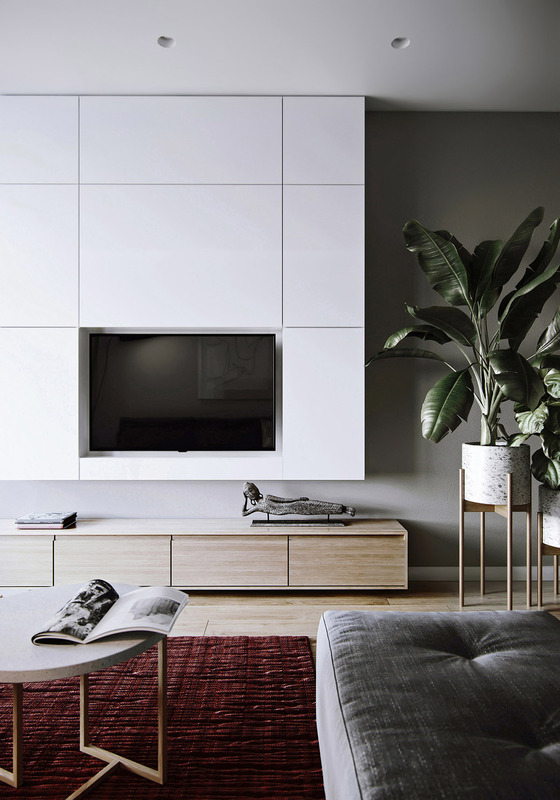 Plant stands hold lush leafy specimens by the tv wall, which is equipped with wall mounted white storage cabinets and a sleek low level oak media unit. A set of nesting coffee tables stand on timber leg frames in the centre of the lounge, next to a cosy knitted pouffe. 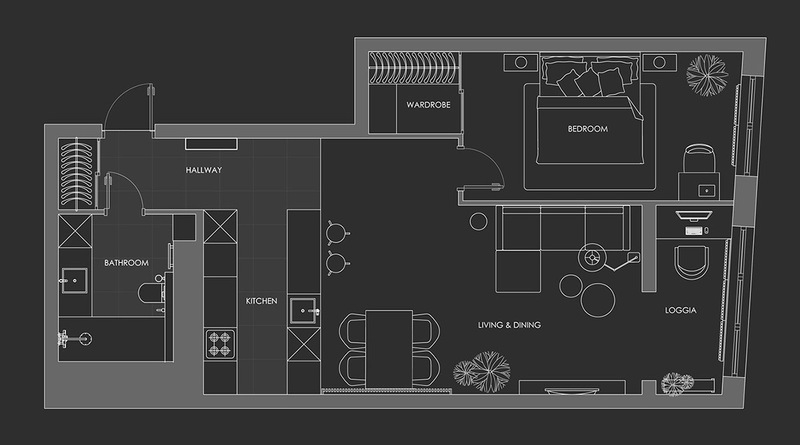 The lounge, kitchen, dining room and work area all flow as one continuous space in this home, with the bedroom being the only separate volume. 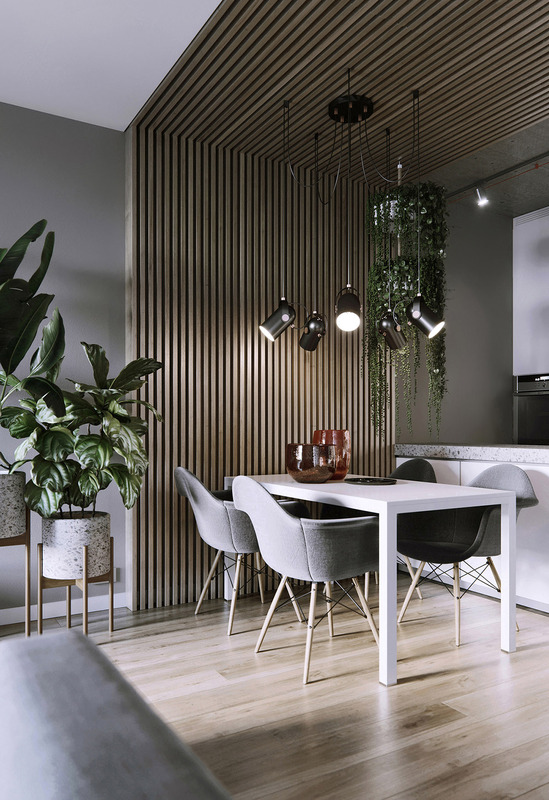 The entire apartment follows one cohesive palette of colour and materials: Crisp white combined with oak and raw concrete. 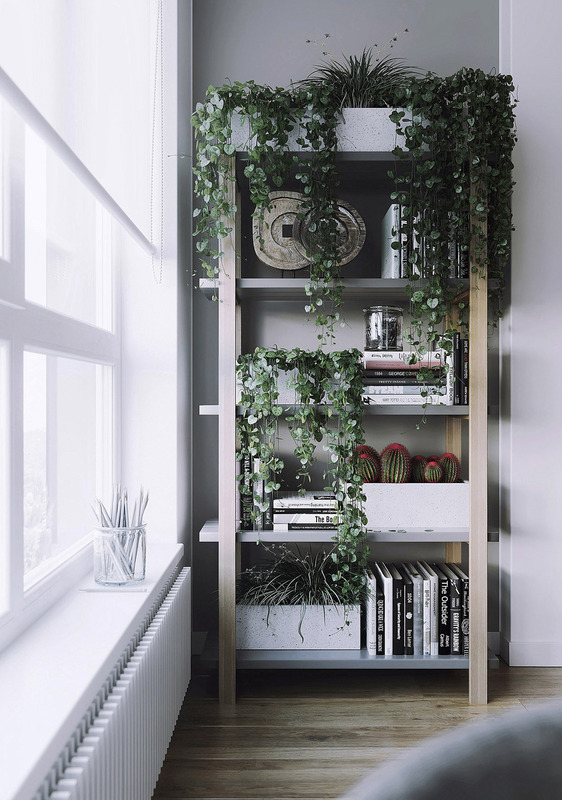 Trailing plants tumble over a shelving unit like green waterfalls. Cacti bring the garnet accent colour back. White gloss kitchen cabinets frame a core of oak wall units. A grey granite covered peninsula has a dining spot at one end. 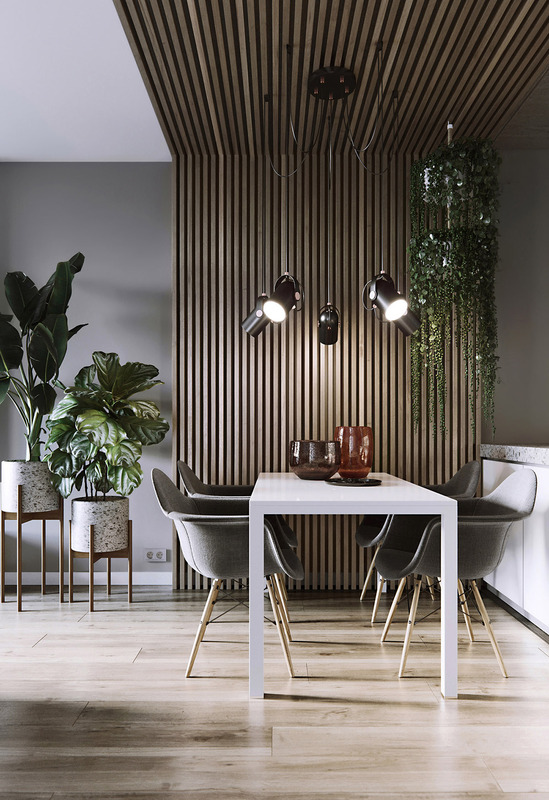 A more formal dining area shelters beneath a slatted feature wall and ceiling wraparound, where hanging plants dangle side by side with the dining pendant lights. Decorative vases bring rouge tones to the table. In the bedroom, the headboard feature wall has a textile look, which makes the room look soft and quiet. A globe bedside table lamp glows gently on a sleek white drawer unit. 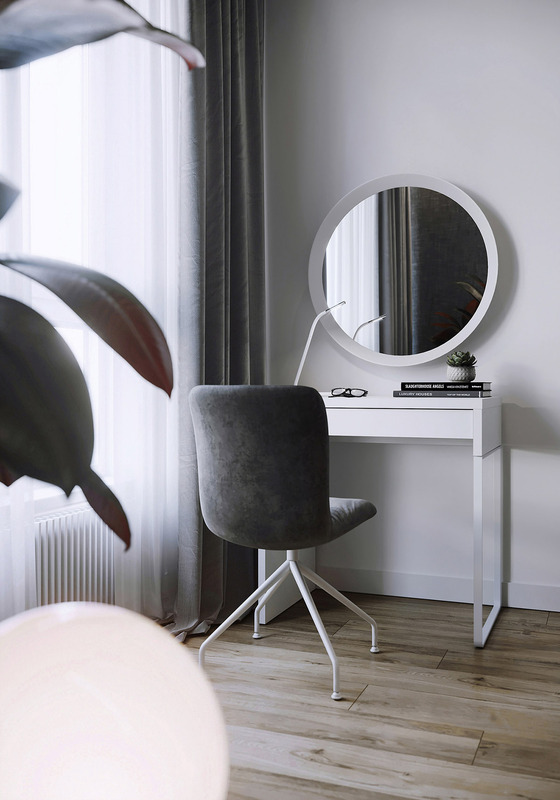 A grey swivel chair is seated at a small dressing table by the window. Perimeter lighting shines down over the grey headboard wall and an oak slatted wall feature. 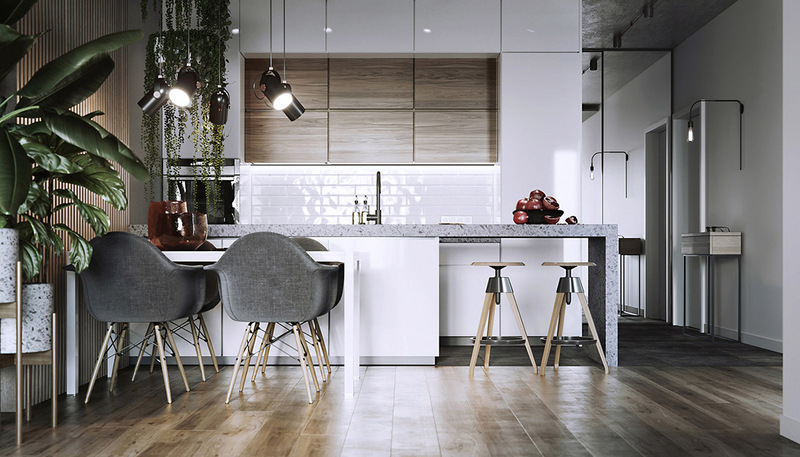 A plush grey rug warms the wood floor. 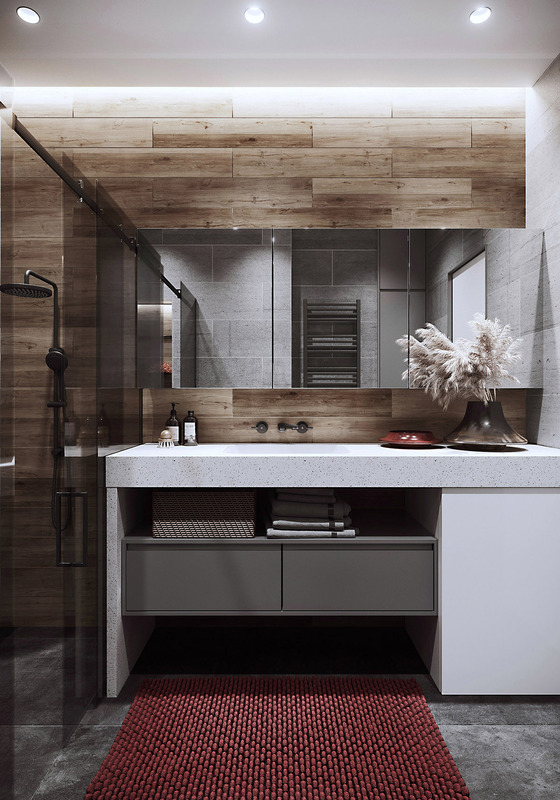 A white concrete countertop covers the modern bathroom vanity. Dried fronds provide a feathery vase arrangement. 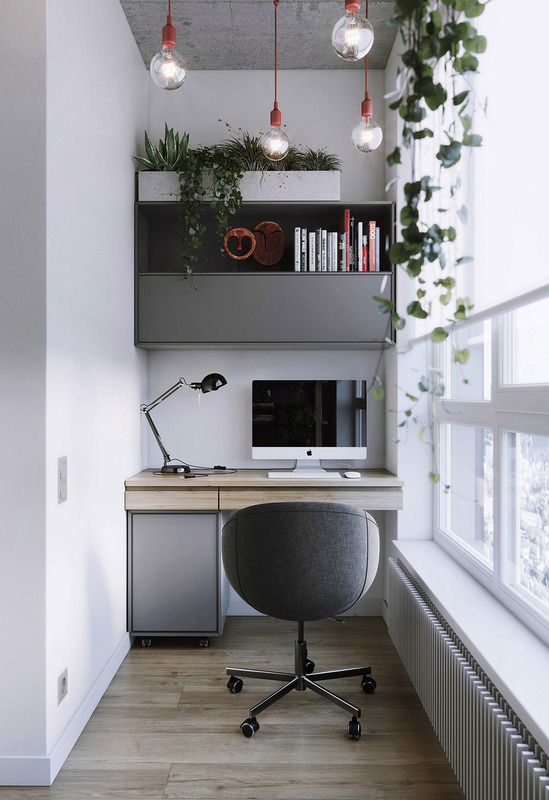 Plants appear to have taken over the tiny minimalist home office, where they dangle down over the bookshelves and provide perfect contrast with red pendant lights. 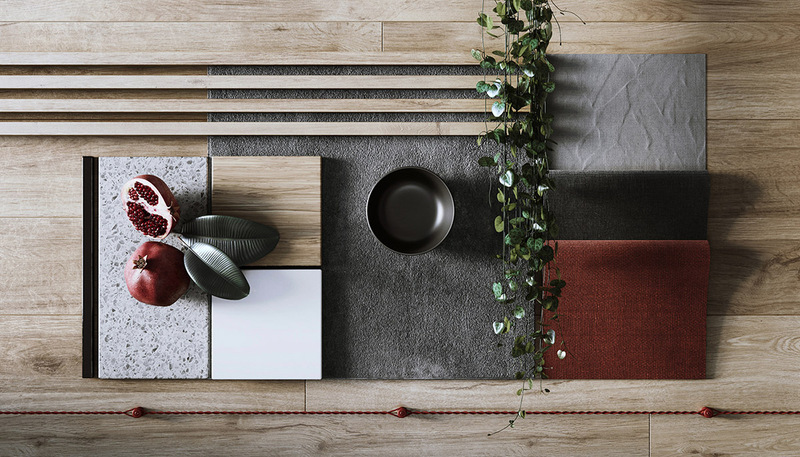 Mood board showing the palette and materials used throughout the design: Garnet/pomegranate red accents, oak timber, raw grey concrete and grey granite, white surfaces and slatted features walls. Our final tour has an open and airy feel – almost as though it were outdoors. 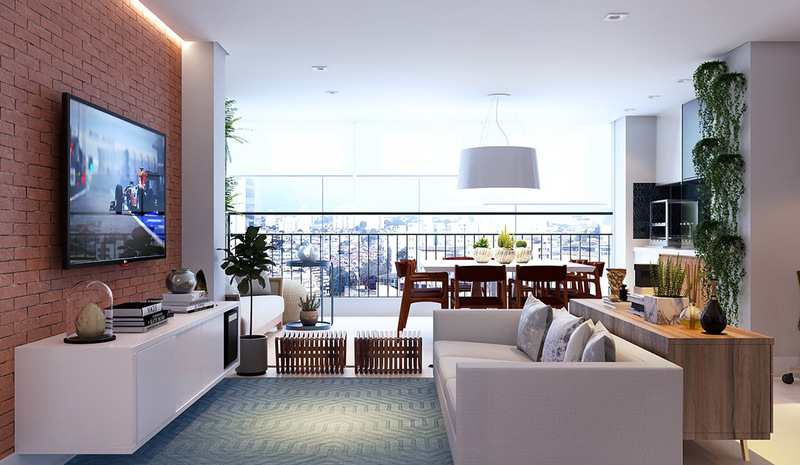 Panoramic windows let natural light flow in, creating perfect conditions for cultivating indoor plants. 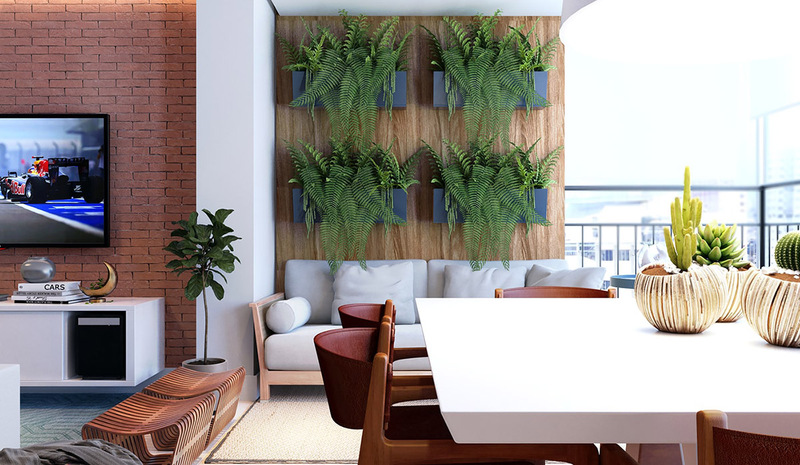 Four wall planters support lush greens. The fronds fill the entire feature wall, making stunning contrast against a wood panel backdrop. Cascading plants flow down a support column behind the sofa, next to the home office area. The hanging plants serve as a pretty room divider between the study and a wet bar/kitchenette, which is attached to the dining room. The full kitchen/butler kitchen is located behind the home office. Blue wall cabinets make an interesting addition to a run of white and wood base units. 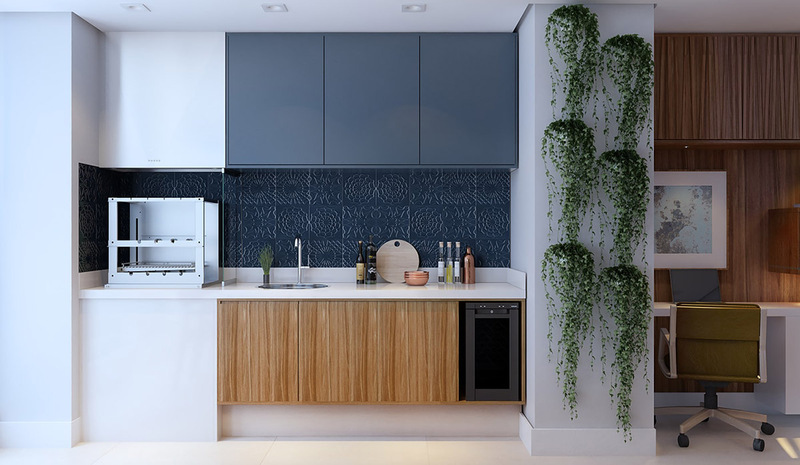 Stunning blue wall tiles complete the look, behind a tiny planter for greenery. 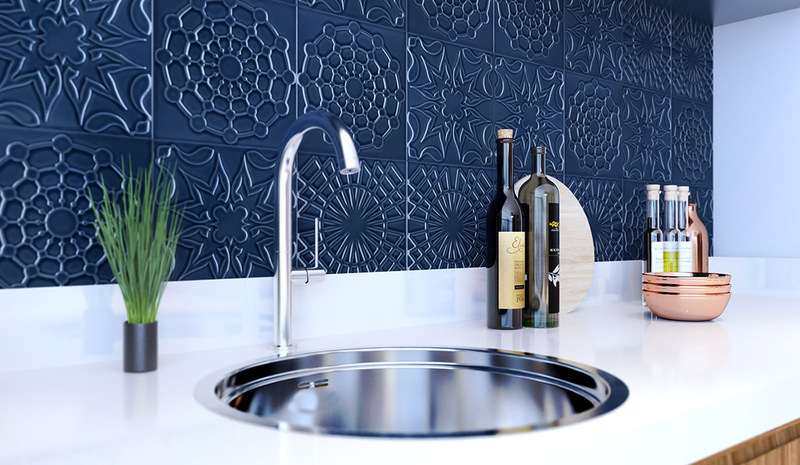 A monochrome botanical print decorates the wall of the open plan space.